According to multiple sources of ours, tomorrow morning, Verizon will unleash its response to the recent changes made by both T-Mobile and AT&T. Big Red is going to announce new “MORE Everything” plans that aim to give customers more data at no extra cost, doubled bandwidth, free 25GB of cloud storage, and unlimited international messaging. If you are a part of Verizon’s EDGE upgrade program, you will see extra discounts on your line access as well, which could vary depending on the amount of data you are signed up for. Let’s talk about it all. The document below details the new plans, but we’ll try to summarize. In terms of data packages, you’ll soon find the 500MB $40 now offers 1GB of data for the same price. The same thing goes for the 1GB $50 plan, which jumps to 2GB, and the 2GB $60 plan, which jumps to 3GB. The rest of the tiers appear to be staying the same. 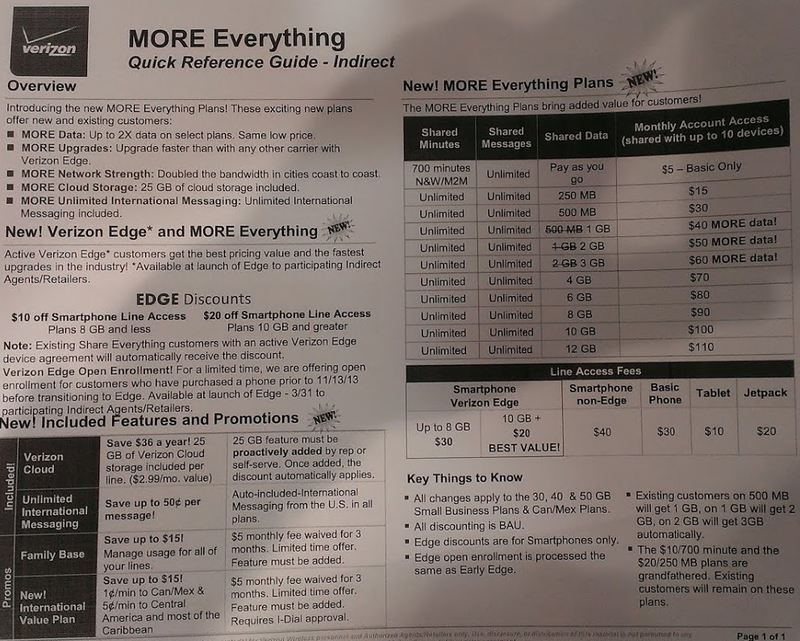 If you are a part of Verizon EDGE, they are now offering you line discounts depending on the amount of data you are paying for. So if you are on a plan with 8GB of data or less, you’ll receive a $10 discount on your line. If you are on a 10GB or higher plan with EDGE, you’ll see a $20 line discount. Current participants in EDGE will automatically receive this discount. So what exactly is this discount? Verizon normally charges $40 per smartphone plus the price of your data package. With these new discounts, you’ll see that $40 drop to either $30 or $20 depending on your data package. In other words, this is Verizon finally removing the phone subsidy from their plans if you are paying for a phone on EDGE. Verizon is also claiming that it will offer doubled bandwidth in “cities coast to coast,” that they will hand everyone 25GB of Verizon cloud storage, and are opening enrollment in EDGE. Also, Verizon has confirmed that “#MORE is coming” on Twitter.